Don’t MIND me… | ARChive of Contemporary Music, or "Would You Take My Mind Out for a Walk"
Accept it; he is the Master of Self-Suggestion. Nay, the Impossibilist. But, relax? This Reveen is in the Valley of Creepsville. The Latinate vocal pace is, we hope, slightly, electronically altered slowspeech that one could imagine the devil or an alien brain-only intelligence in a B film mouthing. The catch phrase, “I maintain at all times a calm, confident cheerful state of mind,” meant to give you the relaxing confidence that breeds success, trips off the tongue like an anvil – he’s no Mahesh Yogi and this is no-man’s mantra. 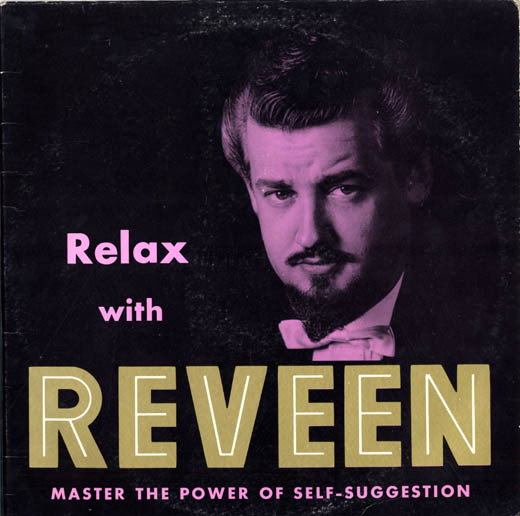 And here’s a GREAT youtube video of Reveen with Regis Philben. Look at Regis work it. He’s such a professional. I have the Stop Smoking and Overeating one. I could only listen to it for a few seconds, until he said the word, “moist” in a really unsettling way.